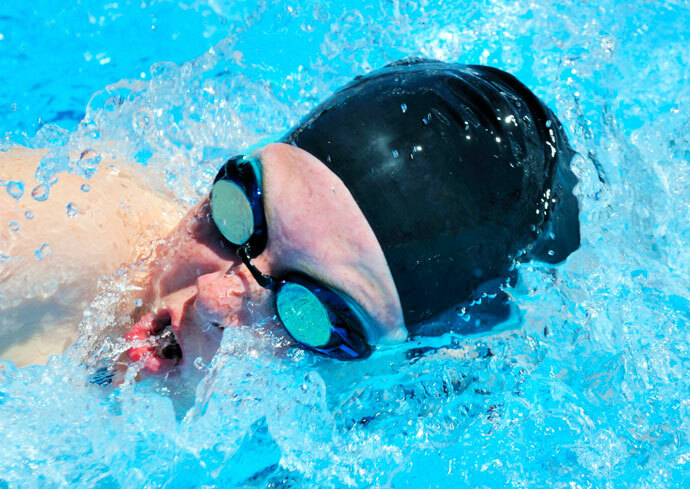 Breathing issues are pretty common while learning the front crawl stroke. Breathing properly in front crawl requires practice. Even though experienced swimmers make it look easy, there are a few hurdles to overcome to breathe seamlessly in the front crawl stroke. For example, you need to synchronize breathing with the arm and leg movements, as you can only inhale at specific moments of the stroke cycle. Furthermore, the arm and leg movements are asymmetrical, which increases the difficulty. Add to this that you need to roll on the side to breathe, and you have a few reasons why it takes time to master breathing in front crawl. We propose the following series of exercises to learn to breathe in the front crawl. 1) Stand in shallow water, so that you have water up to your waist. 2) Bend at the hips, until your torso is horizontal and your chest and face are in the water. Your head is in a neutral position. 3) Keep your arms along your sides (or dangling in the water). 4) Exhale in the water. 5) Once you have finished exhaling, turn your head to the side until your mouth is above the water surface, and inhale. 6) After inhaling, turn your head downward again, and start exhaling. 8) Practice inhaling on one side only, then on the other side only, and then on one side after the other. Drill #2 is similar to drill #1, except that you add the arm movements to the breathing cycle. 2) Bend at the hips, until your torso is horizontal and your chest and face are in the water. Your head is a neutral position. 3) Extend both arms forward. 4) Start to exhale in the water. 5) At the same time, start the underwater arm stroke movements with one of your arms. Keep the other arm extended forward. 6) As your pulling hand reaches your hip, turn your head toward that side until your mouth is above the water surface. 7) Start to inhale, and at the same time recover your arm forward like you would do when swimming front crawl. 8) At the end of the arm recovery, turn your head downward again, and start to exhale. 10) Practice inhaling on one side only, then on the other side only, and then on one side after the other. 1) Put on swim fins and grab a kickboard. 3) Push off the ground, get in a horizontal position on your chest, extend your arms forward, holding the kickboard at arms’ length, and start to flutter kick. 4) Keep your head in a neutral position, so that your face is in the water and you are looking down. 5) Exhale in the water while kicking to move forward. 6) Once you are out of air, turn your head (and also a bit your body) to the side, until your mouth is above the water surface, and breathe in. 7) After you have taken a breath, turn your head down again, and start to exhale. 8) Repeat several times (or for a few lengths). 9) Practice inhaling on one side only, then on the other side only, and then on one side after the other. Drill #4 is similar to drill #3, except that you add the arm stroke movements to the drill. 1) You are wearing swim fins and holding a kickboard. 3) Push off the ground, start flutter kicking, and get into a horizontal position while holding the kickboard at arms’ length. 4) Your head is in a neutral position, with your face turned down. 5) Exhale in the water and start the underwater arm stroke movements with one of your arms. Keep holding the kickboard with the other hand. 6) As your pulling hand reaches your hip, turn your head (and body) toward that side until your mouth is above the water surface. 9) Repeat several times (or for a few lengths). 10) Practice inhaling on one side only, then on the other side only, and then on one side after the other (switching hands holding the kickboard). Drill #5 is basically the same as drill #3, but without a kickboard. 1) You are wearing swim fins. 3) Push off the ground, get in a horizontal position on your chest, extend your arms forward, and start to flutter kick. 6) Once you are out of air, turn your head to the side, until your mouth is above the water surface, and breathe in. 8) Repeat several times (or for several lengths). If this drill is difficult to do without a kickboard, you might have to improve your balance in the water first before coming back to this drill. Drill #6 is basically the same as drill #4, but without using a kickboard. This drill is also called the Catch-Up Front Crawl Drill. 3) Push off the ground, start flutter kicking, and get into a horizontal position with arms extended forward. 4) Exhale in the water and start the underwater arm stroke movements with one of your arms. Your other arm stays extended forward. 5) As your active hand reaches your hip, turn your head (and body) toward that side until your mouth is above the water surface. 6) Start to inhale, and at the same time recover your arm forward like you would do when swimming front crawl. 7) At the end of the arm recovery, turn your head downward again, and start to exhale. 8) Once your active arm is completely extended, switch sides and execute an arm stroke cycle with the other arm, including breathing, while the previously active arm stays extended forward. 9) Continue swimming with these catch-up arm movements, switching arms each time. 10) Repeat several times (or for several lengths). In this drill, you start to swim front crawl while moving both arms simultaneously. Because you previously only used one arm at a time, in the beginning, it most likely will be a bit difficult to move both arms simultaneously. You will keep your swim fins on, as they will help you to keep your legs up and to move forward. This will help you to focus on your arm movements and breathing. 1) Swim front crawl with your fins, and breathe on the same side for the whole length. This means you are breathing every other arm stroke. 2) Breathe on the other side for the next length. 3) Continue swimming front crawl for a few lengths, switching breathing sides after each length. In this drill, swim front crawl with your swim fins on, but now alternate breathing sides. To do so, you will inhale every third arm stroke instead of every second arm stroke like you did in the previous drill. 1) Push off the ground, extend your arms forward, start to flutter kick, and start to pull underwater with your right arm. 2) Breathe on the right side while recovering the right arm, and start to pull underwater with the left arm. 3) Start to exhale as soon as the right arm re-enters the water and finishes recovering forward. 4) Continue exhaling while the left arm recovers forward and the right arm pulls underwater. 5) Continue exhaling while the left arm pulls underwater and the right arm recovers forward (your head/face stays turned down). 6) Finally, inhale on the left side while the left arm recovers forward and the right arm pulls underwater. 7) Continue swimming using this breathing pattern, inhaling every third arm stroke on alternating sides. It is important for beginners to practice breathing on both sides, as we do with this drill, to develop a balanced swimming stroke. Now try to swim front crawl without swim fins. Hopefully, you will be able to swim without too much trouble. However, if it still is difficult for you to coordinate breathing and swimming after practicing the drills above for several swim sessions, it might be that other issues exist in your swimming stroke. If this is the case, I suggest that you have a look at our main series of drills to learn the front crawl. I have been learning the front crawl for over eighteen months and I still cannot get to the stage where I can turn my head to breathe. I know I have a fear of water and every time I try to rotate I feel like I am falling into the water and I lose it. I just stand up. Please help. Is there an easier way to learn how to breathe in the front crawl? We have an article covering fear of water. We also have a series of exercises to learn the front crawl.